i came across this painting last year in the Art History 103 course and it's now one of my favorites. Peter Paul Ruben's depiction of St. George slaying the dragon is filled with intense emotion. The horse bucks aggressively as St. George slashes at the beast with fury. I love the way that Rubens used light to magnify the emotions of the painting. The darkness signifies the danger of the situation and the light over St. George signifies the triumph of good over evil. Also the light illuminates the princess and the sheep that sit in the background and to the side. Another thing that is striking to me about this painting is the way the horse and St. George stare down toward the dragon. This is obviously a tool that Ruben used, quite cleverly; to draw the spectators attention to the action. The dragon stares out at the view also almost begging you to stare back. 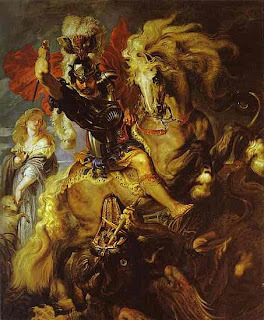 Thirdly Rubens used color as a tool to bring the emotion out of the painting. The dragon is dark and evil looking while the horse shines with a gold tint. To me this is another signal for good over evil. St. George's red cape serves as a starting point for the viewers eyes. I began at the top then surveyed the scene vertically from top to bottom. Peter Paul Ruben's version is my favorite and i hope that everyone enjoys it as much as i do. Great image and great discussion, Greg- notice how the composition is very active and swirly, full of energy and life. it is a clear indicator of the Baroque, a period/style of "over the top" decoration and excess.